Members of DAA Victoria Chapter take a stand against Citizens United. MELBOURNE – Thursday evening at the University of Melbourne Law School, the Victoria chapter of Democrats Abroad Australia (DAA) braved wet weather and chilly temperatures with an organized demonstration against the highly-controversial Citizens United v. FEC U.S. Supreme Court decision stemming from 2010. Chief Justice of the Court, John Roberts, who was visiting Melbourne, voted with the majority of justices in the 5-4 decision. 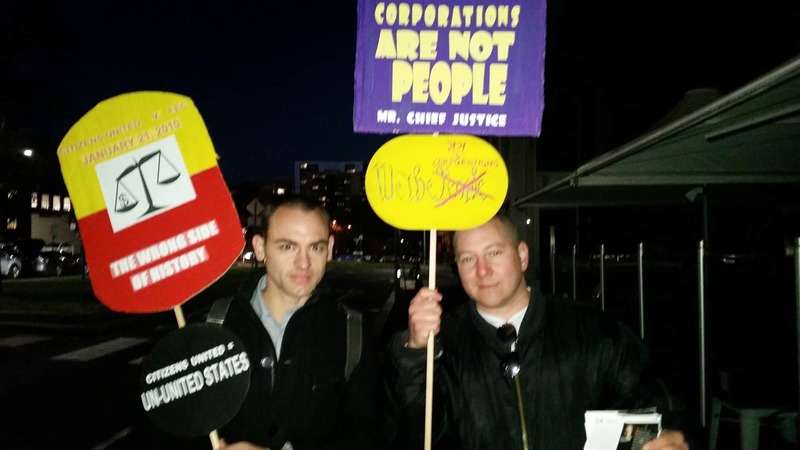 Local DAA members distributed literature and raised protest signs to illustrate everyday Americans’ displeasure with Mr. Roberts’ Citizens United vote and his support for the contentious “corporations are people” claim. The 2010 decision allowed U.S. corporations and unions to contribute essentially unlimited amounts of money into American politics. As a result, money has flooded into federal campaigns and has given the top-earning 1 percent a significant financial advantage of political persuasion in reducing the influence of every day voters. This has also led to the rise of ‘SuperPACs’ which indirectly support one candidate while attacking the opposition thereby leading to an increased amount of negative discourse in federal elections. With such a high-profile U.S. government official visiting Melbourne, DAA members ensured that their peaceful demonstration was felt on the street and sidewalks outside of the venue where Mr. Roberts was guest lecturing. Members had robust conversations with the public and attendees of the Roberts lecture, including a prominent political officer from the U.S. embassy in Canberra who was attending the lecture. DAA Victoria Chairman, Thomas Lopez, led the local demonstration. “The Citizens United decision has only increased the political rift in the United States and inherently corrupts the system. The ruling should be overturned,” said Mr. Lopez when asked why he came to protest. “Everyday Americans, even those living abroad, like me, are disgusted by the unlimited dark money flowing into U.S. elections. I came here to remind the Chief Justice that his vote to allow this assault on our democracy isn’t forgotten,” stated Michael Ramos, another local DAA member in attendance. Chief Justice Roberts will reconvene the new session of the U.S. Supreme Court beginning in October. Democrats Abroad is the official arm of the U.S. Democratic Party for Americans residing outside of U.S. states and territories. The Victoria chapter of DAA is an active and dedicated group of members that primarily focus on exercising their right to vote from abroad and electing Democratic candidates, and raising awareness of and advocating for issues that concern Americans living abroad.